Add water to a boil in a large pot and season with salt. Blanch cabbage leaves in batches for approx. 3 – 4 min. or until they are soft. Remove from water and let them cool. Add rice and one-third of the water to a small pot and bring to a boil. Reduce heat and let simmer with the lid on for approx. 5 – 6 min. until the rice is half cooked. Cut a cross into the bottoms of tomatoes. Bring water to a boil in a small pot and blanch tomatoes until you see that the cut splits open, then remove the tomatoes with a slotted spoon and transfer them into a bowl of ice water. Afterwards gently pull the skin off the tomatoes and purée them. Peel and chop the onions and garlic. Peel and dice carrot. Chop parsley. Heat vegetable oil in a frying pan over medium heat and fry onions, garlic, and carrot for approx. 3 min. or until browned. Remove from heat. Add ground beef, ground pork, fried vegetables, parsley, half-cooked rice, and pureed tomatoes to a large bowl. Season with salt and pepper and stir to combine. Cut out stems of blanched white cabbage leaves. Place approx. 2 – 3 tablespoons of the meat filling into the center of each cabbage leaf, roll it tight, and set aside. Repeat process with remaining cabbage leaves and filling. Add sour cream, tomato paste, and remaining water to a bowl. Season with salt and whisk to combine. Heat some vegetable oil in a large roasting pan over medium heat and fry cabbage rolls on all sides. Add tomato-cream sauce, cover, and let cook with a lid over low heat for approx. 30 min. 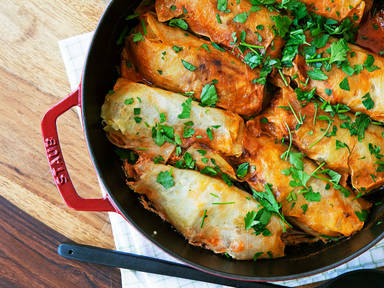 Serve cabbage rolls with chopped parsley on top. Enjoy!